International studies Prof. Ian Kelly (left) discusses Russian-Georgian relations with Georgian Ambassador David Bakradze. The two spoke in Harris Hall on Monday. David Bakradze, the Georgian ambassador to the United States, discussed Georgian-Russian relations and Georgia’s efforts to join NATO and the European Union at a Monday event in Harris Hall. 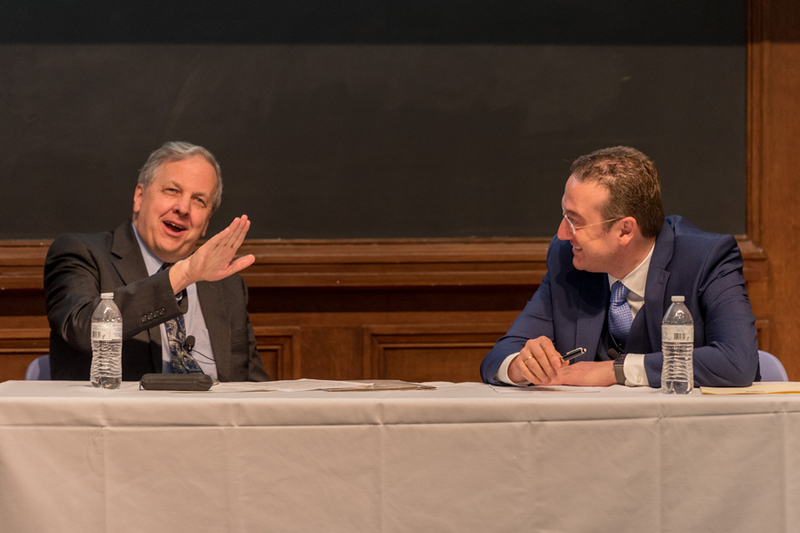 Bakradze spoke to about 80 students and administrators on a panel alongside Ian Kelly, a former U.S. ambassador and current international studies lecturer. The event, which was the 2018 Barry Farrell Lecture, was co-sponsored by the political science department and Slavic department. U.S. Sen. Amy Klobuchar (D-Minn.) sent a video lecture to participate in the event, and political science Prof. Jordan Gans-Morse moderated the discussion and the subsequent audience Q&A. Kelly, who kicked off the event with a lecture about Georgia’s choice to join the “Western community of nations,” said Georgia faces many challenges in its effort to join NATO and the EU. In 2008, Russia invaded autonomous Georgian territories South Ossetia and Abkhazia, violating Georgia’s sovereignty. Following Kelly’s lecture, Bakradze spoke about Georgia’s challenges and successes since the Russian invasion in 2008. Bakradze emphasized the role of internal reform in fighting for Georgia’s entrance into NATO and the EU. This year marks the 100th anniversary of Georgia’s 1918 independence from Russia, Bakradze added. Klobuchar closed out the lecture portion of the event with a video addressing U.S. relations with Georgia. In the video, she said it is important to increase funding for foreign assistance programs that help countries like Georgia. Like Bakradze, Klobuchar commented on the anniversary of Georgia’s independence and commended Georgia in its quest for democracy. She also stressed that the U.S. should continue to support Georgia’s “hard-fought and hard-won” independence. Bakradze said he was inspired when he first came to the U.S as a 14-year-old exchange student, having known nothing about the U.S. besides the movies that survived Soviet censorship. Weinberg sophomore Claudia Sierra, who attended the event, said she took a class about politics in Russia last quarter, which led her to take interest in Monday’s lectures.